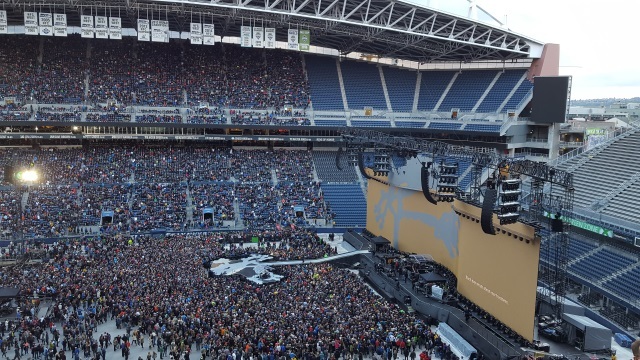 But U2 went big, got a bit distracted yet ultimately pulled off a solid show in front of 55,000 on Sunday for the Joshua Tree Tour 2017 at CenturyLink Field in Seattle. 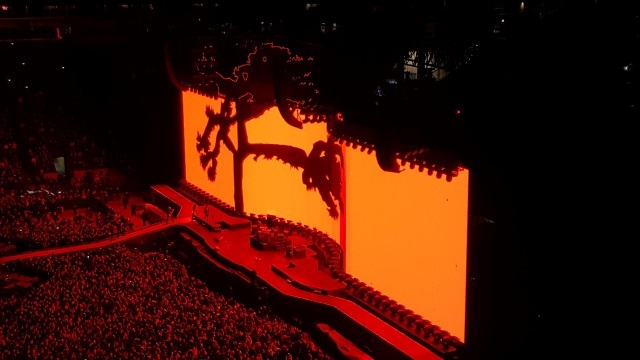 U2 put the usual boisterous theatrics on hold this time instead opting for a large, rather striking background screen concaved in the middle that offered the accompanying visuals and video for the setlist. No tornado of lights engulfing the band like on the 360 tour or the gigantic screen allowing singer Bono to walk down memory lane as he did last time out. It was honest and unimposing allowing the band to focus on the music while the music focused on the band. However, the show got lost at times in the bowels of the massive NFL stadium and simply begged for a smaller, homely arena setting that offers an added touch of magic that worked so well on Innocence+Experience. Indeed, U2 still commands a vast audience and considering the current tour’s modest length it certainly makes sense to open the doors as wide as possible verses a long string of multiple dates in every major city in venue’s a third the size but by doing so they forfeited immense potential on a celebratory journey through time. 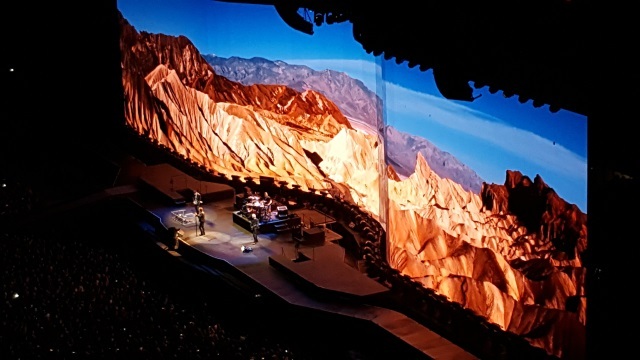 U2 opened their 23 song two hour set with “Sunday Bloody Sunday” as drummer Larry Mullen, Jr. first appeared on the main stage, walked along a cat walk to a secondary stage (shaped like the Joshua Tree symbol) in the middle of the general admission crowd to his drum set, The Edge followed and started into the song’s guitar opening, then Bono and bassist Adam Clayton. It was evident from the start a bit of charm and much warmth was missing. The wind blowing in from the Puget Sound interfered with the music quite a bit and the stadium’s large cavity offered little-to-none in terms of acoustics. Clayton’s bass sometimes overpowered, while The Edge’s guitar cut in and out like a car speaker with a bad connection that needs a couple of fists in its side to work correctly. A stadium setting also produces an echo which is not only distracting but causes the band to sound out of sync at times. Plus, you’ve got the unintended consequence of a massive spread-out audience singing the lyrics ultimately competing with Bono’s voice. U2 carries a stage presence like no other but at times even these music titans looked small (yes, visually too) and had a hard time commanding the stage. Yes, Bono’s political activism was on full display. You didn’t expect to attend a U2 concert to forget about whatever is happening in your life for a while or America’s rapid fall from Grace, did you? U2 boasts an unusual preoccupation with the United States as the video screen displayed both very patriotic themes – a woman painting in elapsed time an American flag while the band played “Trip Through Your Wires,” Bono crediting the United States and the American tax payer for funding much of the $18 million tab towards AIDS research – and what felt like a bit of lecturing. He took a centrist approach commenting on the party of Lincoln and the party of Kennedy after “Pride” and an originalist approach when he said “government should fear it’s citizens not the other way around” which considering he pals around with a former president of this country widely feared by many (rightly or wrongly) makes you wonder who he is referring to but the commentary was mostly to push his One campaign that he claims boasts 8 million members worldwide. Take a grain of salt if this figure is reached based on the emails collected by the advocates from those waiting in line to enter the venue. Overall, despite some of the sound issues, mostly minor but often and on-going, “Where the Streets Have No Name” was very cool but the turbulence of the sound system served to enhance “Bullet the Blue Sky” with that exceptional chaotic guitar solo. “Running to Stand Still” bested the album version (with Bono on the harmonica) and “One Tree Hill” also excelled except for the popping in the speaker during the last half of the song. Unfortunately, the beloved “With Or Without You” fared with little luster and Bono well off-key. And yes, The Joshua Tree is a legendary 80s album but it’s a good bet the final two songs were heard for the first time by many last night and devotees probably heard them again, for the first time. Bono went off on an outlandish “Eeny, meeny, miny, moe” rant (seriously, what the hell?) in the middle of “Exit” and even Pearl Jam frontman Eddie Vedder helping out on “Mothers of the Disappeared” couldn’t save this boring wreck. “Elevate” which has some natural distortion was awesome and U2 featured a new song “The Little Things That Give You Away” which evidently needed some kinks to work out from the first performance on Friday. It was OK, a bit meandering at first but picked up midway through. U2 closed the evening with a tight performance of “I Will Follow” the only cut off the band’s first album, Boy from 1980. Expect a new politically charged album sometime this year likely titled Songs of Experience as a follow-up to the now three-year old Songs of Innocence.